Among the prominent and worthy citizens of Grant township whose lives are devoted to agriculture and the farming interests of the county is the subject of this biography, whose home is on section 11. He was born in Champaign county, Ohio, on the 6th of September, 1851, a son of J. H. and Sarah (Ellis) Fairchild, both of whom were natives of the same state and are now living in Coggon, Linn county, Iowa. They came to this county with their family in 1855, and the father purchased four hundred acres of land in Spring Grove township, two hundred and fifty acres of which was covered with timber. He at once commenced to improve and cultivate his land. Henry Fairchild was reared in Spring Grove township, and pursued his education in its district schools until nineteen years of age. He remained under the parental roof until he attained is majority, giving his father the benefit of his labors. On the 20th of March, 1870, he was united in marriage with Miss Walton, a daughter of J. H. and Maria (Cunningham) Walton, natives of Canada and Ohio, respectively. Her family were among the pioneer settlers of Spring Grove township, this county, where the father first purchased eighty acres of wild land, and later bought a timber tract of forty acres. He filled the office of justice of the peace for a number of years, and both he and his wife held membership in the Methodist Episcopal church. His death occurred in 1883, and she passed away the following year. Unto Mr. and Mrs. Fairchild were born thirteen children, as follows: Lena, now the wife of Fred Van Tassel, a farmer of Buchanan county, Iowa; John, who married Julia Hudson, and is engaged in farming in Grant township, Linn county; Edward, who married Nellie Hudson, and also lives in Grant township; Sarah, wife of Louis Hudson, a farmer of the same township; Rebecca, wife of William Horak, a farmer of Grant township; Agnes, Clarence, Matilda, Emma, Blanche and Jennie, all at home; Fred, who died in infancy; and Ross, at home. After his marriage Mr. Fairchild was engaged in farming in Spring Grove township until 1892, when he purchased an improved farm of one hundred and thirty-five acres on section 2, Grant township, conveniently located two miles east of Walker. He has since added to this property and now has three hundred and twenty acres on sections 2 and 11, Grant township, all of which is well improved and under a high state of cultivation. In connection with general farming Mr. Fairchild also devotes considerable attention to the raising of stock, and in his undertakings is meeting with well-deserved success. As a Republican he takes quite an active and influential part in local politics, and in January, 1895, was elected supervisor of his township, which office he creditably filled until January, 1901. He is now a member of the school board, and takes an active interest in all enterprises calculated to advance the welfare of his township or county. Fraternally he is a member of the Camp of Modern Woodmen at Walker. Henry Fairchild, one of the prosperous agriculturists and prominent citizens of Grant township, is the owner of a well improved farm of three hundred and twenty acres on sections 2 and 11. His birth occurred in Ohio on the 6th of September, 1851, his parents being J. H. and Sarah Ann (Ellis) Fairchild, who were likewise natives of the Buckeye state. They came to Linn county, Iowa, in 1855, purchased a tract of land on section 1, Spring Grove township, and here continued to reside throughout the remainder of their lives. The mother passed away in 1870, while the father was called to his final rest in August, 1909, when eighty-two years of age. Unto this worthy couple were born seven children, four of whom still survive, as follows: Ada, who is a resident of Coggon, Iowa; Hattie, the wife of Fred Willis; William, living in Sully county, South Dakota and Henry, of this review. The last named, who was but four years of age when he came to this county with his parents, attended the common schools in the acquirement of an education and remained at home until the time of his marriage in 1870. He has devoted his attention to general agricultural pursuits throughout his entire business career and in 1892 purchased his present home farm of three hundred and twenty acres on sections 2 and 11, Grant township, where he has resided continuously since. 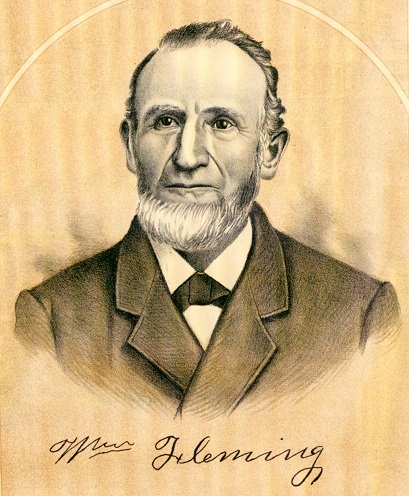 In addition to cultivating the cereals best adapted to soil and climate he makes a specialty of raising and feeding stock and has found both branches of business congenial as well as profitable, He is likewise one of the directors of the Walker State Bank and is widely recognized as one of the enterprising and representative citizens of the community. In 1870 Mr. Fairchild was united in marriage to Miss Deborah Jane Walton, a native of Linn county and a daughter of J. H. and Maria Walton, both of whom were born in Ohio. They came to this county in the early '40s, entering eighty acres of land and erecting thereon a log cabin. The mother was called to her final rest in 1883, while the father survived until 1894, when he, too, passed away. They reared a family of nine children, seven of whom are yet living. Unto Mr. and Mrs. Fairchild were born thirteen children, namely; Lena, the wife of Fred Vantassel, of Grant township; John H., likewise a resident of Grant township; Edward J., living in Dawson county, Montana; Sarah A., who married L. Hudson, but both are now deceased; Rebecca, the wife of William Horrack, of Linn county; Agnes, who is the wife of William Norris and makes her home in Buchanan county, Iowa; Clarence, who is a resident of this county; Matilda, the deceased wife of Roy Melick; Emma, the wife of Frank Chester, of Linn county; Blanche, who is the wife of Charles Leach and resides in Buchanan county, Iowa; Jennie, who is now attending normal school; Frederick, who is deceased; and Ross, at home. Mr. Fairchild is a republican in political views and is now serving in the office of township trustee, having held that position for nine years. He likewise acted as county commissioner for six years and has ever discharged his official duties in a manner that has won public approval and commendation. Fraternally he is identified with the Modern Woodmen camp at Walker, while his religious faith is indicated by his attendance at the Methodist Episcopal church, with which his wife is also affiliated. Having resided within the borders of Linn county for fifty-five years, he has gained a large circle of friends which is almost coextensive with the circle of his acquaintances, and his salient characteristics are such as have won for him the unqualified respect, esteem and good will of his fellowmen. Wesley B. Fee, an enterprising and successful farmer and stockman of Grant township, is the owner of a tract of land comprising one hundred and forty acres on section 33. His birth occurred in Linn county, Iowa, on the 15th of July, 1867, his parents being George W. and Almira (Miller) Fee, who were natives of Indiana and Ohio respectively. They came to this county in 1845 and were married here, spending the remainder of their lives on a farm in Grant township. George W. Fee was called to his final rest on the 12th of March, 1909, having for a number of years survived his wife, who passed away in March, 1897. Both were consistent and devoted members of the Church of Christ and were highly respected and esteemed throughout the community where they resided for so many years. Their children were three in number, as follows: William H., who is a resident of Center Point; Cynthia A., the wife of Benjamin Cress, of Center Point; and Wesley B., of this review. Wesley B. Fee received his education in the common schools and when eighteen years of age started out on his own account as an agriculturist, devoting his attention to the operation of a rented farm for six years. On the expiration of that period he purchased the old homestead of one hundred acres and lived thereon for fifteen years, being busily engaged in its further cultivation and improvement. On disposing of the property he bought his present place of one hundred and forty acres on section 33, Grant township, where he has carried on his farming interests continuously since, his industry and energy being annually rewarded by bounteous harvests. His wife owns a tract of forty acres on section 4, Washington township. He is likewise well known as a stockman, raising, feeding, buying and selling stock of all kinds. His undertakings have been attended with a gratifying measure of success and he well deserves recognition among the substantial and progressive citizens of his native county. As a companion and helpmate on the journey of life Mr. Fee chose Miss Estella Cox, who was born in this county in 1873, her parents being J. M. and Fannie F. (Smith) Cox. The father, a native of Canada, still survives and resides at Center Point. The mother, whose birth occurred at Center Point, was called to her final rest in 1880. They reared a family of three children. Mr. and Mrs. Fee likewise had three children, namely: Bernard V., whose natal day was April 16, 1893; Fannie E., born March 27, 1895; and Minnie V., who was born February 11, 1899, and passed away April 19, 1909. Mr. Fee is a stanch democrat in politics but has never sought nor desired office as a reward for his party fealty. The cause of education, however, has ever found him a stalwart champion and for several years he served as a school director. Fraternally he is identified with the Modern Woodmen Camp, No. 948, at Center Point, in which he has filled all of the chairs. His religious faith is that of the Christian church, with which his wife is also affiliated. They have spent their entire lives in Linn county and enjoy a wide and favorable acquaintance here. History of Linn County Iowa From Its Earliest Settlement to the Present Time, Volume II, The Pioneer Publishing Company, 1911 pgs. 58-59. Some time during the spring of 1849, Mr. James Ferguson and wife came into our community and located on what was originally a part of my father’s claim. He was born in Beaver County, Pennsylvania, and both he and his wife were members of the Congregational church. After coming here they and their daughter united with the First Presbyterian church, and later Mr. Ferguson was elected to the office of ruling elder. The sons came into the church some years after. Of the five sons, Calvin, Cyrus E., Amos, Clement and James, only Cyrus and Clement remain; the former living in Chicago, and the latter occupying the old homestead. Mr. Ferguson was a man of sound judgment and of the strictest integrity. He was mild in his disposition and kind and gentle in his treatment of others. He was strongly attached to his church and was ever a strong pillar of support within its walls. He died April 27, 1850, after a short illness, mourned not only by the church of which he was an honored member, but by the community at large. His wife, a most noble, Christian woman, survived him till May 9, 1886, when she, too passed away to join her husband in the land beyond. The record of these two people here is brief and inadequate, but the salutary influence of their lives lingers as a lasting benediction to the community in which they lived. Amos was taken prisoner and died in Andersonville prison February 28, 1865. James died at the old homestead December 24, 1890. Source: Carroll, Rev. George R., Pioneer Life In and Around Cedar Rapids, Iowa from 1839 to 1849, pages 172-3, Times Printing and Binding House, Cedar Rapids, Iowa, 1895. Frederick P. Fernow, whose efforts as a farmer and stock-raiser have been attended with a well merited measure of success, is the owner of two hundred and ten acres of valuable land on sections 4 and 33, Marion township., His birth occurred in Linn county, Iowa, on the 18th of September, 1868, his parents being Samuel and B. A. Fernow, of whom more extended mention is made on another page of this work. In his youthful years he enjoyed the educational advantages afforded by the common schools, and after attaining his majority he devoted his attention to the operation of the old homestead farm for a few years, having been reared to the work of the fields. In the fall of 1906 he purchased a tract of eighty acres on section 33, Marion township, in the further cultivation and improvement of which he has since been actively engaged. The well tilled fields annually yield bounteous harvests and his operations as a raiser and feeder of stock are likewise proving profitable. On the 27th of February, 1894, Mr. Fernow was united in marriage to Miss Olive B. Howard, who was born in Galesburg, Illinois, in 1871. Her parents, Frank M. and Helen C. (Gage) Howard, who are likewise natives of Illinois, removed to Ottumwa, Iowa, in 1904. Mrs. Fernow had but one brother, Fred M,, who is now deceased. By her marriage she has become the mother of four children, as follows: Esther Pearl, whose natal day was March 23,1895, and who is now attending the high school at Marion; Howard M., whose birth occurred February 5, 1900; and Margaret E., and Marjory H., twins, who were born July 24,1905. In politics Mr. Fernow is a republican and, as every true American citizen should do, keeps well informed on the questions and issues of the day. The cause of education finds in him a stalwart champion and he has served in the capacity of school director, but aside from that has not held nor desired public office. His entire life has been spent in Linn county and he is widely recognized as one of its substantial agriculturists and esteemed citizens. Edwin B. Fisher, constable of Spring Grove township for the past six years and recently a candidate for the office of sheriff of Linn county, is one of Iowa’s sons who is typical of that class of men who have developed the middle west. He is a native of the township in which he resides and has always maintained his home here, although for several years he traveled through the extreme western portion of the country. The date of his birth was October 2, 1869, and he is a son of the late Edwin Fisher and Mrs. Mary (Fitts) Fisher, early settlers of Linn county. His father was born in New York. His early education was received there, and he also read law in that state, preparatory to his admission to the bar. But his health and fortunes demanded that he seek another location, so he came west and settled in Linn county, Iowa. He and his wife located in Spring Grove township, where he purchased one hundred and twenty acres of land and commenced farming. After a time he began buying other properties, for he was very successful in his work, and later practiced law, having been admitted to the bar in this state. He followed his profession for about fifteen years, then discontinued it entirely and devoted his attention exclusively to his farms. At the time of his death, which occurred January 23, 1904, he owned over four hundred acres of fine land. His wife, who is also a native of New York and is yet living, makes her home at Walker, Iowa, being in her seventy-sixth year. Edwin Fisher remained with his parents upon the home farm until he was twenty years old. He received a good education in the district schools of Spring Grove township, and then went to work for himself, renting eighty acres of land, which he farmed for five years. For three years he traveled about the west, going as far as the coast, and upon his return to Linn county embarked in the business of painting and paper hanging, which he continued to follow. He makes his home upon one of the smaller but finely improved farms of the county, cultivating twenty-six acres of land, upon which he has made all of the improvements. On June 16, 1897, Mr. Fisher was united in marriage to Miss Gertie Powell, a daughter of Chester and Emma Powell. She passed away January 25, 1900, leaving one son, Carl E. now aged eleven years. On April 4, 1906, Mr. Fisher was again married, his second union being with Mrs. Julia Ellsworth, a daughter of Mr. and Mrs. Norman Pike, natives of Vermont and Iowa respectively, at present living in Central City, Iowa, where her father owns and operates a fine farm. By this marriage Mr. Fisher has two children, namely: Fred C., aged three years, and Bessie I., aged eight months. Mrs. Fisher had one son by her former marriage, Harold, now eight years of age. She is a member of the Christian church and is active in religious work. Mr. Fisher is a member of the Odd Fellows Lodge, No. 299, at Troy Mills, and his political allegiance is given the republican party. He has been constable of Spring Grove township for six years and at the recent primaries he hotly contested the nomination for sheriff with W. G. Loftus, who secured it by a narrow margin, Mr. Fisher having many warm partisans. An honest, determined man, he makes an efficient officer and a very desirable citizen. History of Linn County Iowa From Its Earliest Settlement to the Present Time, Volume II, The Pioneer Publishing Company, 1911 pgs. 410-411. WILLIAM FLEMING, one of the foremost dairymen and farmers in Otter Creek Township, was born in Jefferson County, Ind., March 20,1832. He is a son of John and Mary (McCrury) Fleming, natives of Kentucky. The father was born in 1785 and died in February, 1835, in Indiana; the mother was born in 1795 and died in March, 1877. They were the parents of eight children, as follows: Jennie A. married Jacob Ferris, and is now deceased; Betsy H. married Mr. H. D. Medcalf; James married Miss Armede Evans; Polly married H. Medcalf; John married Miss Julia Payne; Nancy became the wife of T. Evans; Samuel is still single; and William, our subject. his brains in carrying on his work. In politics Mr. Fleming is independent. Though he has no taste for public office, his fellow-citizens have honored him by electing him for several years to the position of District Supervisor and Township Trustee. Mr. Fleming is a member of the Christian Church, and was a building Trustee in that body. Known far and near for the excellence of his judgment, his unswerving integrity in business transactions, and his generous liberality, he cannot help but have the esteem and confidence of his community. He has been first and foremost in all good works, and has taken a leading part in the material development of the township and the county, besides contributing largely to moral, social and charitable objects. A portrait of Mr. Fleming and view of his farm, residence and out-buildings, appear in another part of this work. William Fogarty owns and operates a finely improved farm of one hundred acres in Buffalo township, Linn county. He is a native son of the state, born in Dubuque county, in 1858, his parents being Daniel and Mary (Cleary) Fogarty, both natives of Ireland, They came to America at a very early day and spent five years in New York state, whence they removed to Dubuque county, Iowa, where the father spent several years in railroading. He then rented a farm in Buffalo township, Linn county, operating the same for three years, and at the end of that time he was enabled to purchase forty acres in that township. This proved but the beginning of his success, however, for as he prospered he kept adding to his original holdings from time to time until at his death his possessions aggregated five hundred and sixty acres of land, which he divided among his children, each of his sons receiving one hundred acres, while the remainder was given to his other children. He was twice married, William, the subject of this review, having been born of his first marriage. His mother died in 1865, and in 1868 the father was again married, his second union being with Mrs. Ellen O 'Neal, who was born in Ireland, and by whom he had three children, Maggie, Daniel and John, The father died November 14, 1908. William Fogarty acquired his education in the common schools and was early trained in the work of the fields, assisting his father during the periods of vacation. Putting aside his text-books, he gave his entire time to the cultivation of the farm, remaining under the parental roof until he was thirty years of age. He was then given by his father the one hundred acres of land on which he now makes his home, this being located in Buffalo township. He has made many modern improvements on the place, which include a good country residence, a substantial barn and outbuildings for the shelter of grain and stock, and everything about the place is neat and attractive in appearance, indicating the progressive methods of the owner. On the 6th of June, 1899, occurred the marriage of Mr. Fogarty and Miss Bridget Fay, a daughter of Edward and Margaret (Mulconery) Fay, who were natives of Ireland. In early life they emigrated to America, first locating in Chicago, but after ten years spent in the western metropolis, they made their way to Jones county, Iowa. There the father purchased one hundred acres of land, operating the same until the mother's death in February, 1898, after which he lived retired in Anamosa until he passed away on the 6th of August, 1909. Their family numbered six children. Politically Mr. Fogarty is a democrat and at present is serving as township trustee. Both he and his wife are members of the Catholic church. He shows good judgment in the conduct of his business affairs and in his work is meeting success. In this enlightened age when men of energy, industry and merit are rapidly pushing their way to the front, those who, by their own individual efforts, have won favor and fortune, may more properly claim recognition. To this class belongs Alphonse Franchere, who in connection with his brother, O. J., is proprietor of the Fair, a large department store of Cedar Rapids. He came to this place in 1885, and has since been prominently identified with its mercantile interests. Mr. Franchere was born in Chicago, Illinois, on the 4th of February, 1861, and is a son of David and Matilda (Moffit) Franchere, both natives of Montreal, Canada. The mother died when our subject was a small boy, leaving nine children, of whom five are still living, namely: Mrs. P. U. Magnan and Mrs. N. F. Chiniquy, both residents of Chicago; Oscar J., who is with our subject in business; Gabriel, a merchant of Chicago; Alphonse, of this review; and Napoleon F., a resident of Mason City, Iowa. Euclid died in Chicago in 1871, and two others died in early childhood. The mother's death occurred in 1863, when she was thirty-nine years of age. The ancestors of our subject were of French extraction. His paternal grandparents both died in Chicago in 1864, when well advanced in years. All of their children lived to be over seventy-eight years of age, and one daughter is still living in Chicago. Our subject's father, who was the youngest of this family, engaged in merchandising in Canada in early life, and about 1850 removed to Chicago, where he conducted a crockery store until about ten years before his death, which occurred in 1898, when he was seventy-eight years of age. He was a self-educated man, and in business affairs was quite successful. Like the other children of the family Alphonse Franchere was educated in the public schools of Chicago. The sons all obtained their business education in the large mercantile establishment of Marshall Field & Company of that city. On leaving that firm our subject sought a location with the view of embarking in business for himself, and finally decided on Cedar Rapids, where he settled in 1885. Having but small capital he opened a shoe store, and as he became familiar with the wants of his customers he gradually enlarged his stock as fast as his resources would permit. He began business at No. 212 First avenue, occupying only about one third of the space he now has, and two years later opened a dry goods and fancy goods department at No. 214. In 1889 he again enlarged his store by an addition forty feet square and two stories high, and also increased his stock. In 1891 he secured the adjoining store room, No. 216, and converted his establishment into a regular department store, carrying everything found in a first class general store with the exception of heavy hardware. In 1894 he was joined by his brother Oscar J., from Chicago, and two years later sold to him the crockery, groceries and household goods departments, which now occupy No 218-220-222, while our subject has the remainder of the stock in Nos. 212-214-216. He carries a fine line of dry goods, millinery, shoes, clothing, gents' furnishing goods, furs, carpets, etc. On the second floor he has five rooms devoted to bargain counters, while the six rooms on the third floor are devoted exclusively to the mail order department. Mr. Franchere has recently purchased sixty feet in the rear of Nos. 212-214 and 216 First avenue, where he is building a warehouse for storage purposes. The Fair, by which name their store is known, is fitted up with all modern improvements in the way of heating, lighting, etc. and would be a credit to a city much larger than Cedar Rapids. It occupies the property from 212 to 226 First avenue. By advertising extensively, the firm have secured a large trade from several of the adjoining states, and also from New Mexico and Colorado. They have one hundred and fifty employees on their pay roll, and keep eight delivery wagons and fourteen horses. Their business has grown so rapidly that for the year 1901 it will undoubtedly amount to a quarter of a million dollars. The brothers own property at 216 and 218 First avenue occupied by their businesses. Alphonse Franchere is not identified with any political party, but at local elections votes for the men whom he believes best qualified to fill the office. Fraternally he is a member of the Benevolent Protective Order of Elks and the Commercial Club of Cedar Rapids. He takes considerable interest in outdoor sports, such as baseball, bicycling and horse racing, and is what may be termed a baseball enthusiast. He built the Athletic Park, which has since been sold to the Carnival Association, with which he is connected, and he is also a stockholder of the Auditorium Building. His first thoughts are always for the city of his adoption, and he has been a liberal contributor to all enterprises which he believed would prove of public benefit. He also gives freely to charity, putting his donations where they will do the most good. Pleasant and genial by nature, he makes hosts of friends wherever he goes, and has been a welcome addition to the business interests of Cedar Rapids. Source: Biographical Record of Linn County, Iowa. Chicago: The S. J. Clarke Publishing Company, 1901, p. 759-760. The Fair, which is one of the leading business houses of Cedar Rapids, is owned by Oscar J. and Alphonse Franchere, two brothers, who are numbered among the most energetic, enterprising and successful business men of the city. The older, Oscar J. was born in Montreal, Canada, April 30, 1853, but during his infancy was taken to Chicago by his parents, David and Matilda (Mot) Francere (sic), who were also natives of Montreal and of French descent. The mother died in 1863, at the age of thirty-nine years, leaving six children who are still living, namely: Mrs. E. Magnan and Mrs. N. F. Chiniquy, both residents of Chicago; Oscar J., of this review; Gabriel, a merchant of Chicago; Alphonse, who is engaged in business with our subject; and Napoleon F., a resident of Mason City, Iowa. Euclid died in Chicago in 1871, and Adolphus died in 1898 in Chicago; one other died in early childhood. In early life the father was engaged in merchandising in Canada, and after his removal to Chicago conducted a crockery store in that city until the last ten years of his life, when he lived retired. He was a self-educated man, and in business affairs was quite successful. He died in 1898, at the age of seventy-eight years, and was the youngest in a family of six children, all of whom were older that at the time of their deaths. One sister is still living in Chicago at the age of seventy-four years. His parents died in that city in 1864 when well advanced in years. During his boyhood Oscar J. Franchere attended the public schools of Chicago, and began his business career in the store of Field, Palmer & Leiter, as the firm was styled when Mr. Franchere was with them, of that city, where he remained seventeen years, being head cashier in the retail department nine years of that time. In 1894 he came to Cedar Rapids, and formed a partnership with his brother, taking the grocery, house furnishing, drug, hardware and crockery departments of the Fair, and occupying with these three stores of the building on First avenue, at Nos. 218-220-222, where his brother has carried on business since first coming to this place in 1885. (An extended account of the business is given in the sketch of Alphonse Franchere on another page of this volume.) The brothers own the property at Nos. 216 and 218 First avenue, and our subject also has residence property on the west side of Chicago, valued at fifteen thousand dollars. In 1874 Mr. Franchere was united in marriage with Miss Mary Le Beau, who died in Chicago in 1894, leaving two sons, Alfred O., who is now buyer for the Fair of Cedar Rapids; and Ernest C., who is attending school here. Mrs. Franchere was a native of Chicago and a daughter of Cyrille Le Beau, a prominent contractor of that city, where he built the old court house, the Sherman House, the Tremont House, and many other large buildings. He died there in 1889, his wife in 1892, and all of their six children are now deceased. In 1889, in company with his brother Gabriel, Mr. Franchere attended the Paris Exposition and also visited the principal cities of Europe, spending three months abroad. In the business circles he stands deservedly high, and he and his brother, Alphonse, eminently deserve classification among those purely self-made men of Cedar Rapids. Source: Biographical Record of Linn County, Iowa. Chicago: The S. J. Clarke Publishing Company, 1901, p. 770-771. William A. Fulkerson, one of the leading architects residing in Cedar Rapids, was born in Bucyrus, Crawford county, Ohio, October 17, 1847, and is a son of Joseph F. and Margaret (Messinger) Fulkerson, the former a native of New York, the latter of Pennsylvania. He is the youngest in a family of ten children and the only one living in Iowa. He was carefully reared and received an excellent education in the public schools. In 1856 he came with the family to Linn county, Iowa, the journey being made by teams, and they camped and cooked by the roadside during the four weeks en route. They first located on what is known as the Biggs' farm, between Cedar Rapids and Marion, but after residing there for six months they removed to a farm near Iowa City in Johnson county. The winter of 1856-7 being unusually severe, the crops were almost a total failure, and Mr. Fulkerson, like many others became so discouraged that he returned to his old home in the Buckeye state, the journey being made by way of the Mississippi and Ohio rivers. Only three of the children had removed with the parents to Iowa, though two daughters had previously located there. After the return of the family to Ohio, William A. Fulkerson attended school until the spring of 1864, when he joined the Union army, enlisting in Company E, Thirty-fourth Ohio Volunteer Infantry. His command was a part of Duffey's brigade in the Eighth Army Corps, and participated in the engagements at Lloyd's Mountain, Newburn Bridge, Martinsburg, and the two battles of Winchester on July 24 and September 19, 1864. Mr. Fulkerson celebrated his seventeenth birthday by taking part in the battle of Cedar Creek, where Sheridan made his famous ride. On the 11th of January, 1865, the rebel general Rosseau surprised the Union outposts at Beverly, Virginia, and captured the regiment of which our subject was a member, together with the Eighth Iowa Cavalry, both stationed at that point, but Mr. Fulkerson with about one hundred others managed to escape, and after traveling about forty miles reached the village of Philippi near the Baltimore & Ohio Railroad, where they remained for several weeks. They were then ordered to Cumberland, Maryland, where they went into winter quarters. The regiment to which our subject belonged had lost all its officers above a sergeant, as well as most of its men, and was then consolidated with the Thirty-sixth Ohio Volunteer Infantry, and was afterward a part of the latter regiment. In the spring of 1865 they were ordered to Winchester, Virginia, where they were located when President Lincoln was assassinated. Shortly afterward they were ordered to Staunton, that state, to establish civil law and protect the people. Our subject was mustered out at Columbus, Ohio, July 27, 1865. After his return from the war Mr. Fulkerson did nothing until the following spring, when he became interested in contracting and building. In 1871 he removed to Chicago, where he was employed as an architect until 1876, when he returned to Cedar Rapids, just twenty years after he first came to this county. He built the Soldiers Home at Marshalltown; the Central Hall building of the State Normal School at Cedar Falls in 1895; the Auditorium of Cedar Rapids, which has a seating capacity of thirty-five hundred, in 1899; and ten of the public school buildings of this place, besides numerous fine business blocks and residences. Mr. Fulkerson has been quite prominently identified with public affairs, and served eight years as alderman of the sixth ward, during which time he was chairman of the public improvement committee which had charge of numbering the houses and renaming the streets of Cedar Rapids. He was also a member of the board in charge of the main sanitary sewerage system. While he was a member of the council a franchise was granted the Chicago, Milwaukee & St. Paul Railroad. Socially he is a prominent member of Cedar Rapids Lodge, No 98, K.P. ; T. Z. Cook Post, No. 235, G. A. R.; and Cedar Rapids Lodge, No. 141, I. O. O. F.' Linn Encampment, No. 49; and Canton Cedar Rapids, No. 21, of which he is past commander. He is quite popular both in business and social circles and is regarded as one of the leading citizens of Cedar Rapids. Source: Biographical Record of Linn County, Iowa. Chicago: The S. J. Clarke Publishing Company, 1901, p. 991-992.